Bob Marley image surrounded by a red star. 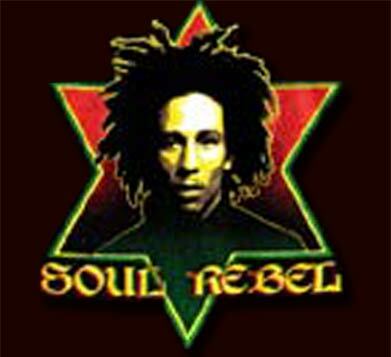 "Soul Rebel" is printed under the image. Printed on 100% cotton, black ribbed knit, tee. Shirt measurement across the front under the arms: Sm-15 inches, Med and Large-16 inches. Length measuring down the back is: Sm and Med-20 inches. Large is 21 inches. Ladies Size Sm - Lg.